Being a biker means you are part of a community. There are 31.2million registered cars in the UK but only 1.2million motorcycles, and as most bikers I know own more than one there's a good chance there are less than one million active bikers. We are the strange ones at work who aren't so interested in football but sit with helmet and gloves on our desk and a bulky leather jacket on our chair. We are the weird ones who, in the age of ever more stringent health and safety, sit astride 15 litres of petrol and ride a missile at silly speeds protected by nothing more than 1.5mm of leather and a helmet. But even though there aren't many of us bikers there are many different types of bikers. I tend to ride my bike most days, to get to the office, meetings and whenever I need to get to London I'll ride the bike rather than sit in a train. Some motorcyclists keep their bike locked away in a garage or shed, own a trailer or van (any van as long as it's a Volkswagen Transporter) to transport it whilst on the road, fit it with slick tyres and wouldn't dream of riding it to work. These are the track day enthusiasts. I'd say I'm a dyed in the wool motorcyclist but until last Friday I wasn't in the track day tribe. I had never ridden a bike on track. During the winter a friend who is a moderator of a forum called South West Bikers told me they hold an annual track day and asked if I'd be interested. Yep. I was definitely interested. The thing that has held me back from attending track days before now is the fact I knew absolutely nothing about the culture. The prices aren't unreasonable but the whole thing seemed impenetrable. Would I be dead slow? Would I crash? Would someone else crash into me? Would everyone look at me as I entered the paddock? Would I feel daft the entire time? Would I remember any of the rules? Would my plain black leathers look out of place in a field of Power Rangers in colourful one piece leather suits? Would I be made to feel like I knew nothing? The SWB day, as I was told, was a friendly track day. It takes place at Llandow in south Wales which is a short and tight little circuit and suited to novice and advanced riders alike. In the paddock would be everything from pure track bikes to people, like me, who would ride home from the circuit. Also, crucially, most people in the paddock would know each other. The track is hired by SWB for the day so the only attendees are forum members. 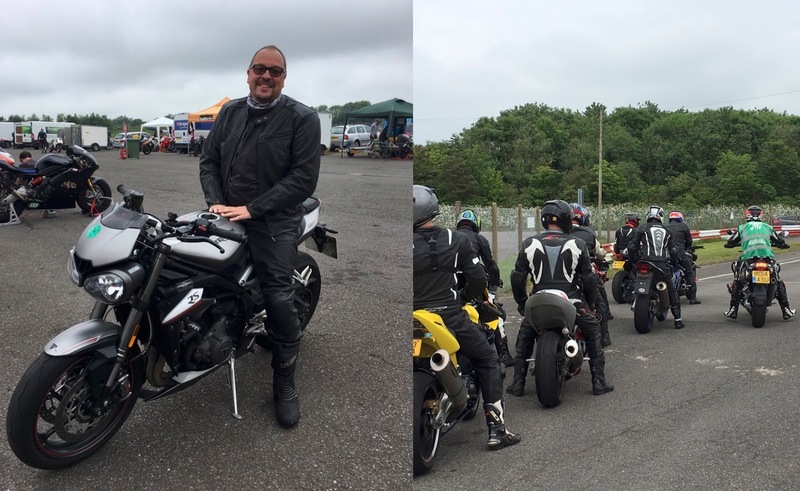 So I found myself at 7am outside the gates at Llandow Circuit in my friend's van with my 2017 Triumph Street Triple RS strapped down in the back alongside her Kawasaki ZX-6R 636 track bike, which had no MOT, no tax and no number plate. It lives only for track days. We were second in the queue of Volkswagen T3s, T4s and T5s and when the gates opened headed for a prime spot next to the main circuit building. We parked 10 metres from a friend's VW Transporter, and everyone else adopted this strange spacing. Then it made sense. As they all got out of their Transporters the first thing they did was erect gazebos to keep the bikes and electrics dry in the rain and for shade from the sun. I've been in many track paddocks and Llandow's isn't much different, it's just smaller than most. The paddock itself is a few acres of tarmac alongside the track. There's a building which has a briefing room on the ground floor and a view of all the circuit on the top floor (though only staff are allowed upstairs), there's a toilet block and there's a cafe. Everyone made themselves busy unloading and prepping their bikes and chatting amongst themselves. The cafe did a roaring trade in teas and coffees and breakfast baguettes and the toilet block took a hammering. Not everyone arrived in a VW van. Some rode in on their bikes and it soon became apparent the variety of machinery on show. There were plenty of sportsbikes but there were also plenty of ordinary road bikes. Someone had brought a £24k 200hp supercharged Kawasaki H2, someone had brought a BMW R1200GS and there were two supermotos. Gratifyingly there were a handful of Triumph Street Triples and a Daytona 675. Once the VWs had all been unloaded there were around 50 bikes parked up, waiting for their time on track. Around a third of the paddock put tyre warmers on their bikes and all of us made sure our bikes were fully fuelled and the tyre pressures reduced to approximately 28psi front and rear, which is lower than you'd run on the road. This is partly because of the heat you put in to the tyre on track, which causes the air inside to expand, and because you want a bigger contact patch than you would on the road. Also, mirrors are either removed or taped up. This made me nervous as I like to know what's behind me but apparently it is safer on track to ride for yourself than someone behind you. The rider's briefing took place at 9.30am and lasted almost half an hour. The chief marshall, John, is both funny and informative. He tells you what you should do and what you shouldn't do. Everyone who wants to ride on track has to attend. When you sign on to a track day you have to specify what group you will be in. On our day these groups were novice, intermediate and advanced. Obviously I plumped for novice and was given a green wristband to wear. Each group would get 15 minutes on track in rotation and there would 17 bikes in each group as well as a travelling marshall/observer who wore a hi-viz vest and who would observe the activity on track and be available for feedback after each session. These marshalls aren't provided by the track but are members of the forum and are generally expert track riders. The advanced group went first and mainly consisted of superbikes. Next up was the inters and then finally us, the novices. Not all members of the novice group are actually novice riders. Most have some track experience and are just comfortable in the novice group. I felt nervous as I checked the bike over one last time, sat astride it and started the engine. We all rode up to the holding area at the end of the paddock and stopped. A marshall checked everyone's wristband and checked our helmet chin straps were properly secured. People talked to friends around them and pulled at gloves, tapped the ground with boots and generally got all the little nervous tics we all have out of the way before the intense focus that awaited on track. Our hi-viz wearing observer rode the BMW GS and in my group was a real variety of bikes, including a bright yellow supermoto, a Suzuki GSX-R 1000 and a couple of other Street Triples. The red light at the end of the paddock turned green and we were off. Llandow circuit is 1.5km long and 9 metres wide. The first section is called Bus Stop and is a tight little series of corners that go left, right, right, left. You then head into a long right hander called Devil's Elbow which leads on to the Hanger Straight at the end of which is a very tight chicane which leads on to a long right hander called Glue Pot. This exits on to the main Runway Straight. The pit entrance is along Runway Straight. We all followed our observer for two laps and no overtaking was allowed. This is done to allow tyres to warm up (mine were stone cold when we started out) and for the riders to get an idea of the track condition. Unlike a road the track was dead flat and smooth, no-one was coming the other way and there were no junctions. There was also no speed limit. My nerves faded as soon as I headed into the tight and technical Bus Stop section. My focus was entirely on what I was doing. The observer set a decent speed but not one at which I felt uncomfortable. I had made sure I was the last rider on track, not wanting to hold anyone up so I could ride easily, knowing I could go as fast or slow as I liked. I watched the rider in front and thought about track position, apexes, braking points. We rode pretty fast and I leaned further in the corners than I ever have, even at this cruising speed. After two laps the marshall let everyone off the leash and the fastest sped off. With every lap I felt more and more comfortable. My speed was dictated by my bravery rather than the limits of my bike and was reasonably good. I wasn't too slow and I wasn't too fast. After a few laps I was overtaken by one of the litre sportsbikes. A couple of laps later I started to get stuck behind a superbike which was slower than me in corners and faster than me on the straights. After a few more laps the chequered flag was waved and it was time to come in. We filed into the paddock and I headed for my spot. I parked up, turned the engine off and grinned. My first session on track had been hugely enjoyable. I loved the speed and the demands on the bike and me. Nobody had been silly and no-one had intimated me on track. I grabbed a cup of tea and drank some water - hydration is important on a track day - and chatted with my fellow riders. People asked me how it had been and gave helpful tips and comments. There was none of the intimidating culture I had perhaps expected. I spoke with another Street Triple RS rider and discussed engine modes. I realised I had had mine set on Road mode so set it to Track. I looked at my tyres and realised the rear looked like a proper race tyre with tiny balls of rubber stuck to it and there was only a centimetre tyre left at the edge which I hadn't used. Half an hour later and it was time for the next session. This time I wasn't nervous at all as we lined up ready to head out. I felt calm and watched what was going on around me. I wasn't at the back as I was happy I wouldn't hold people up. As the session progressed I became more confident. I thought about speed and about what would happen if I dared go faster in the long flowing corners. I thought about how expensive the bill would be if I crashed and I thought about how annoyed I would be with myself if I didn't push as hard as I could. At the end of that session I drank more tea and water and chatted with friends some more. My tyres showed me I had leaned over further and I felt great. As the day progressed I went incrementally faster. I settled into our group and overtook a few and was overtaken by a few. I got stuck behind the superbike some more and overtook some others. At one point the marshall on the GS flew past me! I thought about lines and braking points and tyres. I could feel the tyres moving around as I braked or put the power down exiting a corner. I hardly ever looked at my bike's instruments but forced a quick peek just before the braking point at the end of the back straight and saw 106mph - my friend with the 636 did 117mph at the same point. By the end of the day I was super happy with my riding and beaming with the whole experience. I enjoyed the track, the company, the bikes. My rear tyre was now fully worn right to the edge and I couldn't help but be filled with pride at the fact I had managed to ride fast enough to do this. At 5pm the day was over. We were all exhausted. The Volkswagen Transporters were loaded and the road bikes like mine had the mirrors put back and the tyres pumped up some more. There had been a couple of break downs and just one crash, when someone low sided in a fast corner. He was OK and the bike didn't look too bad. The ride home was pretty arduous - track time really wears you out. I had ridden five sessions of 15 minutes each so that was 75 minutes of hard stopping, accelerating and full concentration. The next day I felt tired and a bit weary but otherwise OK. I really enjoyed my first ever track day. My initial fears were mainly unfounded, although it helped that the day had been organised by South West Bikers who were supportive and friendly. Next year's track day has already been booked with the circuit. If you want a spot you need to join the forum.